Yarrow, common yarrow, or Achillea millefolium is a flowering plant in the family Asteraceae. It is native to temperate regions of the Northern Hemisphere in Asia, Europe, and North America. Yarrow, common yarrow, or Achillea millefolium is a flowering plant in the family Asteraceae. It is native to temperate regions of the Northern Hemisphere in Asia, Europe, and North America. Other common names for this species include gordaldo, nosebleed plant, old man's pepper, devil's nettle, sanguinary, milfoil, soldier's woundwort, thousand-leaf, and Thousand-seal. Here are the 7 health benefits of yarrow. 1. Yarrow may be a great diaphoretic. A diaphoretic food increases perspiration. Yarrow oil has shown to increase perspiration and help remove toxins, excess salt, and water from the body. Extra sweat also cools the body down and gives relief from fevers. 2. Yarrow may assist in digestion. Yarrow helps the secretion of enzymes and digestive juice and increases appetite; both qualities aid in digestion. 3. Yarrow can be antiseptic. Yarrow has been used in the market for its antiseptic properties. The plant heals wounds and activates blood platelets to promote healing. The oil also has bactericidal and antifungal properties, which prevents infection. 4. Yarrow may help with muscle spasms. A muscle spasm is an involuntary skeletal muscle contraction. Muscle spasms in the respiratory system can cause severe coughs. Yarrow oil can help individuals by having a relaxing, antispasmodic effect on muscles, nerves, intestines and respiratory tracts. 5. Yarrow may be anti-inflammatory. The essential oil of yarrow has anti-inflammatory properties that help the nasal or respiratory tracts resulting from the common cold, the digestive system caused by overeating of spicy food, or the circulatory system caused by any toxin getting into the bloodstream. 6. Yarrow may help you stay looking young. 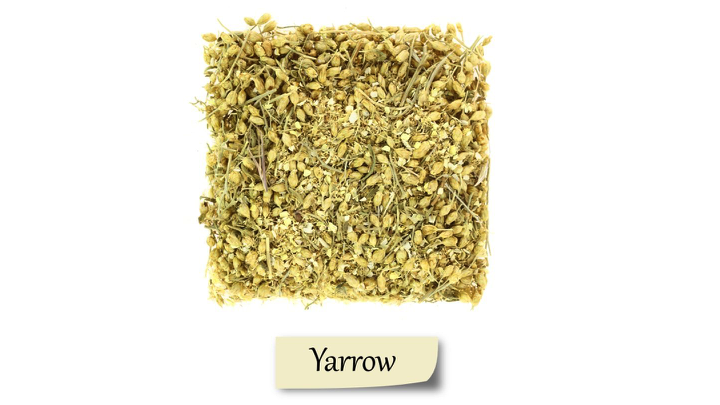 Yarrow keeps the skin free from dryness, cracks, and unsightly marks. This keeps the skin stay looking smooth and young. 7. Yarrow may help tone the body. Yarrow helps optimize metabolic functions like decomposition of food and the absorption of nutrients by toning up the liver, stomach, and intestines and helps individuals grow stronger and healthier. The plant assists in proper excretion regulate the endocrine secretions of hormones and enzymes and boost the immune system. Boswell‐Ruys, C. L., Ritchie, H. E., & Brown‐Woodman, P. D. (2003). Preliminary screening study of reproductive outcomes after exposure to yarrow in the pregnant rat. Birth Defects Research Part B: Developmental and Reproductive Toxicology, 68(5), 416-420. Candan, F., Unlu, M., Tepe, B., Daferera, D., Polissiou, M., Sökmen, A., & Akpulat, H. A. (2003). Antioxidant and antimicrobial activity of the essential oil and methanol extracts of Achillea millefolium subsp. millefolium Afan.(Asteraceae). Journal of ethnopharmacology, 87(2), 215-220. Popovic, M., Jakovljevic, V., Bursac, M., Mitic, R., Raskovic, A., & Kaurinovic, B. (2002). Biochemical investigation of yarrow extracts (Achilles millefolium L.). Oxidation communications, 25(3), 469-475. Rezaie, A., & Ahmadizadeh, C. (2013). Study of sedation, pre-anesthetic and anti-anxiety effects of polar, semi-polar and non-polar fractions of yarrow (Achillea millefolium) extract compared with Diazepam in rats. Life Sci. J, 10, 907-913.